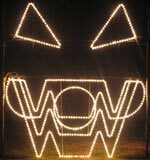 Add the WOW to your Halloween Display with a WowLights Halloween Face! Each face includes 8 individual rope light outputs and frame is powder coated black for all weather use. Includes stand, pre-installed rope lights, ground stakes, and power cords. Sets up and is ready to run in minutes! Also available in a 2 pack with controller. Timing for Faces available in all Halloween Sequences. Requires a Light-O-Rama setup to control the face. Just getting started? Check out our Halloween Controller Packages.